The first post comes from Amy at Very Culinary! She’s taken fresh blueberries and coconut and made mini hand pies! The blueberry juice dripping out of these looks so lickable! YUM! 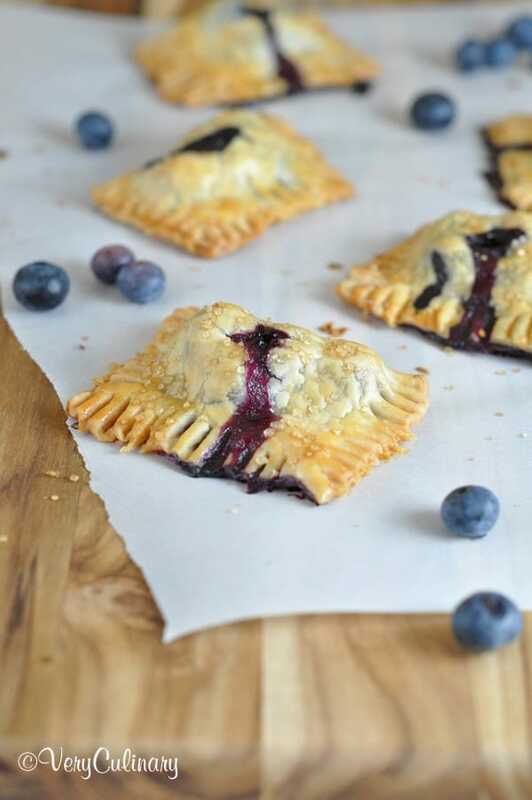 A big THANK YOU goes to Amy for this amazing hand pie recipe!! Make sure to stop by her blog and follow her on social media too! You can find all her links at the end of this post! Hey y’all! Amy from Very Culinary here. When Betsy asked me to help her out with a guest post, I was more than happy to oblige. I can barely keep it together when my husband travels for a week, so to be separated for months (or longer) would leave me fetal. Single parenting is rough! And definitely calls for pie, don’t you think? I love pie – probably as much as Betsy loves cupcakes – all restraint is out the window if it’s sitting in front of me. And I make no apologies for that! Cream pies and fruit pies are among my favorites and I find anything in mini form or portable makes me uber happy. 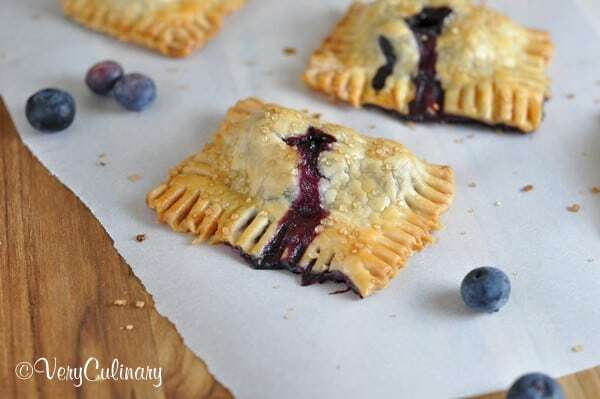 So I made blueberry coconut mini hand pies for you today. 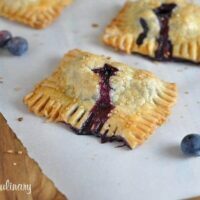 Using pre-made pie crust makes these ridiculously easy, but you could certainly make your own from scratch. Either way, sweet and delicious! 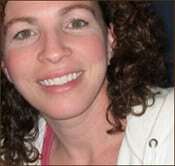 Amy is a Food Blogger, Recipe Developer, Video Maker, Mommy, and Lover of Cookies. She can be found at Very Culinary, on FaceBook, Pinterest, Twitter, and YouTube. Come play along! Preheat oven to 375 degrees. Line a cookie sheet with parchment paper. In a small bowl, toss together the blueberries, coconut, corn starch, salt, and lemon juice. In another small bowl beat the egg and milk together. 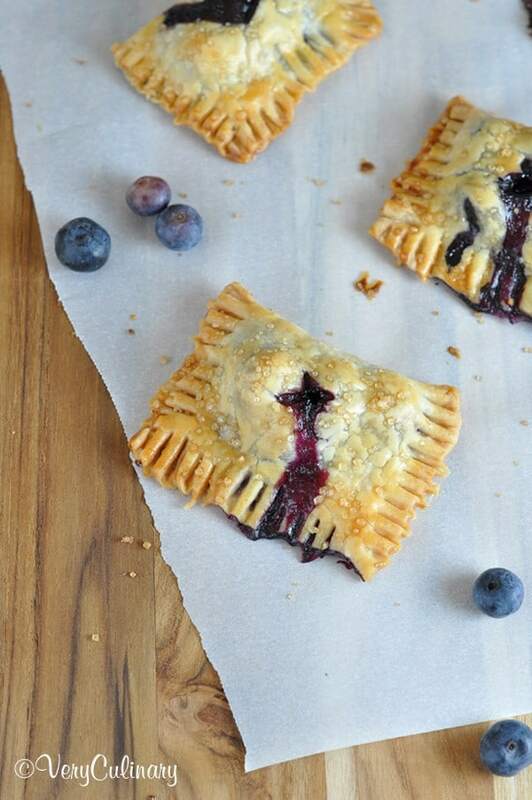 Sprinkle some flour on a large cutting board and carefully unroll one of the pie crusts and place on board. With scissors or pizza cutter, trim the rounded edges. Then cut into 6 equal rectangles. Place a tablespoon of the blueberry mixture on one end; brush edges with the egg wash and fold top half over the fruit to enclose. Using a fork, press to seal. Repeat process with the other pie crust. Transfer pies to the parchment paper, about 2 inches apart. Brush the tops with the egg wash, sprinkle with the turbinado sugar, and slice two small vents in the tops. Bake for 30-35 minutes until golden brown. Serve warm or at room temperature. 40+ Layer Cakes – A Round-Up! This looks great! Is the coconut called for in the recipe sweetened? Hi Kathleen! YES, it is sweetened. I used the sweetened coconut flakes that you find in most store baking aisles. My pleasure being over here today, Betsy! And thanks for including some of my other favorites, too. Those Snickerdoodle cookies are a weakness! Betsy, This is my first vs to your site. I followed the blueberry pastries !!! Actually I wanted to offer my encouragement and support for you, your family, and esp. your husband during his tour overseas. Just wanted you to know that I appreciate the sacrifices you and your family are making to make my life safer. Please accept my thanks and remind your man to stay safe. I’ll be praying for him and all our men and women over there!